Want to keep in the loop on the latest happenings at Chabad of Naperville. Subscribe to our mailing list below. We'll send you information that is fresh, relevant, and important to you and our local community. Debate and disputation are not only encouraged within Judaism but reside at the very heart of Jewish history and theology. 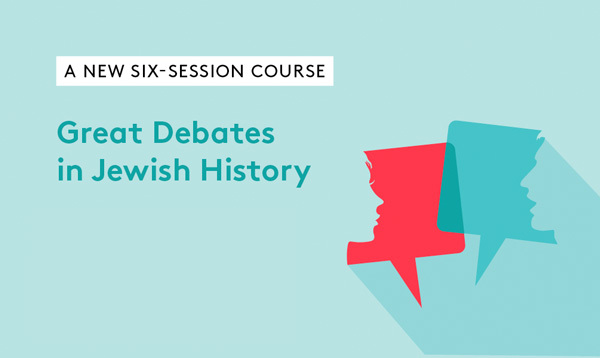 The Rohr Jewish Learning Institute (JLI) presents Great Debates in Jewish History, a six-session course exploring six fundamental conflicts that pit the greatest Jewish minds against each other—six instances of vastly divergent perspectives from throughout our history, including several that remain questions for us today. Discover a stirring and surprising account of Judaism’s intellectual history, from the ancient to the modern-day; as you relive epochs rich in narrative that provide fascinating context for six of the most monumental intellectual and theological debates in our history. The parade of characters presented in this course spans two millennia of biblical, rabbinic, and modern disputation, reflecting the panorama of Jewish history with its monumental political, ethical, and spiritual challenges. Feel free to contact Rabbi Mendy Goldstein with any questions.